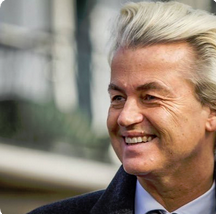 The leader of the Dutch Freedom Party (PVV) has accused Western governments of being “dangerously blind” to the dangers of Islamisation”. Citing recent terror attacks, Geert Wilders also called for an end to Muslim migration. “Islam is a religion of peace, they say but that is a lie. Look at what happened at Istanbul,” he said. “Look at what happened in Orlando a few weeks ago. Look at what happened last March at Brussels airport and metro station, look at what happened at the Bataclan Theatre in Paris last November. Look at what happened in San Bernardino last December. The list is endless. And everything this list has in common is Islam”.